From Israel’s apartheid Wall on Palestinian land to the US Wall of Shame on indigenous land at the border with Mexico – almost 70 walls across all continents are today ripping through people’s lives and lands as they fortify often unilaterally defined borders or limits of state control. They cause thousands of deaths every year and destroy means of livelihoods and hope for many more. They are monuments of expulsion, exclusion, oppression, discrimination and exploitation. 15 years ago Israel started building its up to 8-meter high and over 700km long Wall on Palestinian occupied land as an integral part of its policy to confiscate over 60% of the West Bank and imprison the Palestinian people on not more than 13% of their historical homeland. This adds to its wall surrounding and completely isolating the Palestinian Gaza Strip since 1994. Palestinians have never stopped resisting these illegal Walls and the continuous expulsion of their people from their land and in 2003 called for November 9 – the day the Berlin Wall fell – as International Day against Israel’s apartheid Wall. 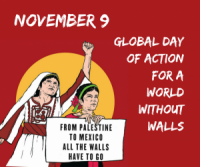 Today it is time we unite against the global proliferation of walls – we call for November 9 as Global Day of Action for a World without Walls. Israel has been central in promoting this new global era of walls and the US has risen to back it up: From India, to Saudi Arabia, to Turkey, Western Sahara and Europe, today, the number of walls designed to forcibly define and seal borders has almost tripled over the last two decades. These walls bar the right to freedom of movement and self-determination. They have become are cornerstones in a world where wars, militarisation and exclusion are to substitute justice, freedom and equality. Walls have not only risen to fortify borders of state control but demarcate the boundaries between the rich, the powerful, the socially acceptable and the ‘other’. They increasingly dominate our cities and societies. Tens of thousands linger as prisoners of conscience or under illegal and inhumane conditions behind prison walls. Visible and invisible walls, as is the case of the blockade of Cuba, aim to bar us from attaining economic, political, social and environmental justice. Where they do not outright promote these walls, governments de facto condone their existence, while a veritable industry of walls literally makes a killing out of all of this. Selling their ideology, methodology and technology corporations team up in arms fairs, biddings and seminars to profit from the construction of these walls. As people affected by these walls and as movements that pose justice, freedom and equality as our tools to resolve the problems of this planet, we join the call for the 9th of November as a Global Day of Action for a World without Walls.